Greater Banjul Area consists of the City of Banjul (St. Mary’s Island) and the agglomeration of Kanifing Municipal Council (KMC) sometimes called (Kombo St. Mary Division). Occupying an area of 93 sq. km (less than 1% of Gambia’s land area), Greater Banjul Area is home to a population of 357,000 (26% of the country’s population). Banjul and Kombo St Mary (Kombo Tubab Banko) were acquired as British crown lands in a treaty with the King of Kombo in 1816. The City of Banjul, formally called Bathurst named after the Earl of Bathurst, who with Captain Alexander Grant founded the City in 1816, was renamed Banjul 1965. Figure 1. Greater Banjul Area. Yellow representing urbanized area. 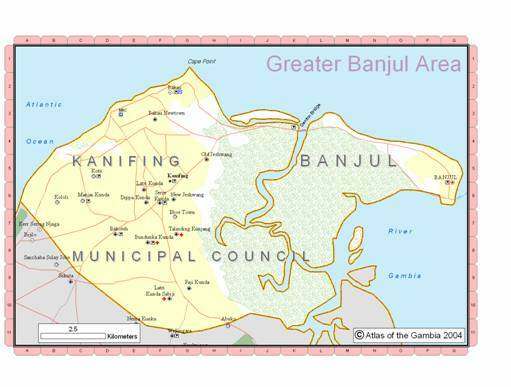 In the 1980s, the name Greater Banjul Area was adopted for the area consisting of both the City of Banjul and the Kanifing Municipal Council. This name change was merely a symbolic one as both cities maintained their separate mayors and administrative structures. Throughout the 1990s and 2000s, KMC continued to grow as the dominant city with all but a handful of the country's major hotels and tourism facilities based there. In addition the National Football stadium, the University of the Gambia and the countries Industrial Estate are in KMC. Despite it's urban surroundings the City of Banjul has a number of areas that are of significance to preserving the country's biological diversity. The city's extensive mangrove swamps and mudflats make it suitable breeding and resting grounds for a large number of Palearctic migrant bird species. The Tanbi Wetland Complex, an area south of Banjul is one of the internationally significant wetlands in the country.